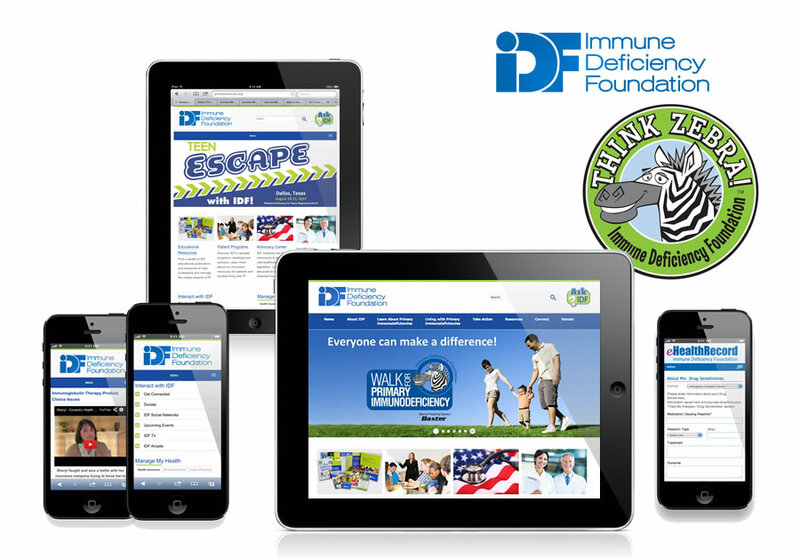 Our early work with Bayer Biopharmaceuticals and Agfa Medical Systems led us to partner with the leading national non-profit fighting on behalf of the Primary Immunodeficiency (PI) diseases community. PI is a group of more than 300 rare, chronic disorders in which part of the body’s immune system is missing or functions improperly. Our mission was multi-fold: How do we raise awareness? Can we impact related research? Can we develop public policy programs to help improve quality-of-life? Our answer, as usual, was “Yes, and…” (We had a hunch that our tech chops might be just what the doctor(s) ordered). Let’s Make a Difference… using a zebra? IDF came upon an interesting analogy from medical school: “If you hear hoof beats, think, ‘horses’, not ‘zebras’.” The problem was, they were dealing with ‘Zebra’ medical conditions across their constituency of roughly 250,000 people suffering from PI (and thousands more going undetected). How could technology make a difference? Over our decade-long relationship, we’ve developed a broad range of solutions to help answer that question: Website development, CRM and donor systems, social network development for specific segments of IDF’s constituency, electronic personal health record development, training video certification systems, and consultancy to support IDF’s selection of volunteering and walks software licensure and configuration (to name a few of our services to date). IDF’s main website is a customized WordPress platform. This solution integrates third-party donations and CRM systems as well as a host of custom configs and plug-ins along the way. 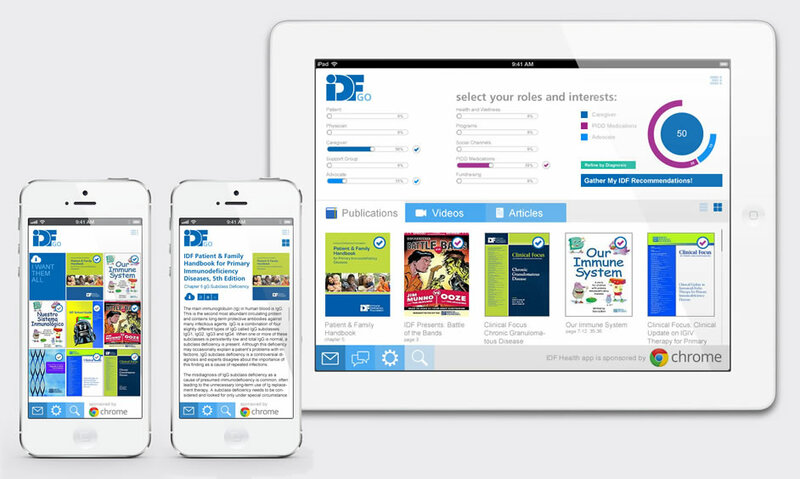 We developed several social networks for IDF which targeted specific demographics. For example, IDF Common Ground is a private social community created exclusively for teens living with PI. Connecting, learning, sharing, and support… sometimes the best medicine is having someone to talk to. 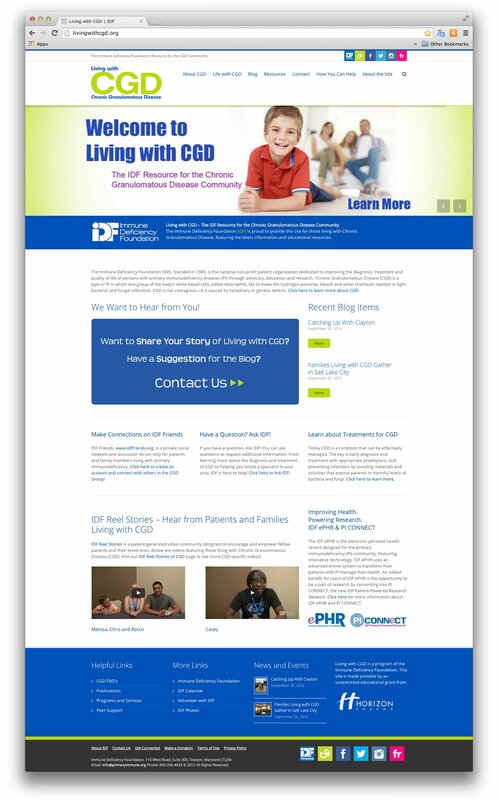 IDF has developed hundreds of publications and collateral aimed at helping their constituents and promoting solutions to physicians and researchers for substantially improved treatment options. We developed an app proposal to help visitors sort, parse, and download relevant materials based on their conditions and needs. Continuing our segmentation and outreach focus, we developed additional targeted WordPress solutions. Easy to deploy, easy to self-maintain, Living with CGD provides comprehensive information about diagnosis and treatment for the Chronic Granulomatous Disease community. Providing well-received support to an underserved community through myriad projects.